This is a recipe that truly benefits from great olive oil, like Sciabica's Mission Variety Spring Harvest. First, the battered artichokes are browned in olive oil. Then the frying oil forms the base of a buttery lemon sauce - not that you can ever go wrong with pan-fried artichokes! It's not the healthiest dish, but it's really tasty. First, you'll prepare the artichokes for pan-frying by battering them. In a medium bowl, mix the flour with 1/2 teaspoon each of salt and pepper. In another medium bowl, whisk together the eggs, Parmesan, 1 tablespoon of parsley, and a few pinches of salt and pepper. Roll the artichoke halves into the flour, then dip them in egg mixture. Heat the olive oil in a large saute pan over medium. 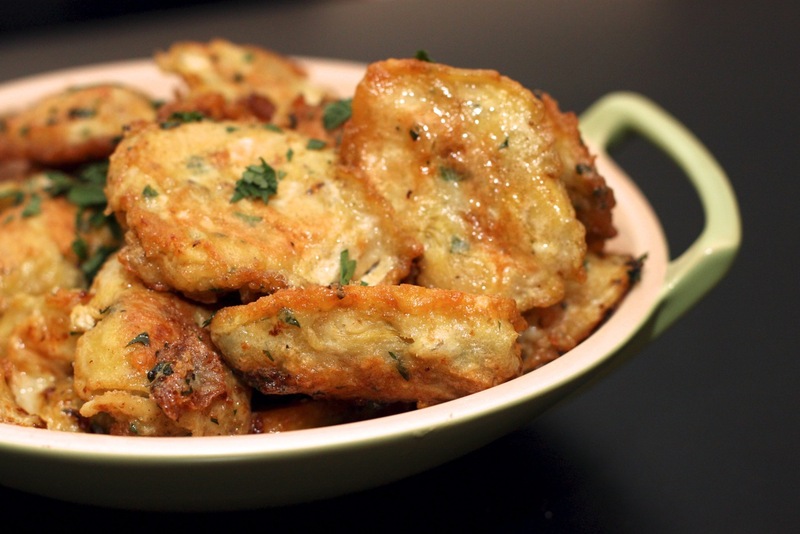 Pan-fry the artichoke halves, flipping once, until crispy and golden brown on each side. Do this in batches, if necessary, so you don't crowd the pan. Let them drain on a paper towel. When the artichokes are done and the saute pan is empty, deglaze with the white wine. When almost all of it has bubbled away, add the butter, lemon juice, and chicken stock (if using). Stir everything together and let it thicken. When thick, add the rest of the parsley, and salt and pepper to taste. Place the artichokes in a serving platter, pour the sauce on top, and serve as a side dish or appetizer. These look amazing. I love artichokes. I am going to make these gluten free. Thanks for this recipe. Monica! It's gorgeous, isn't it?! I was just showing it to my husband! I made your artichoke hearts francaise to accompany my Sunday dinner. They were fabulous, everybody loved them. Can't wait to make them again, this recipe is a keeper!!! Oh, that's fantastic! I will pass this along to Julie! Do you think you fould make these ahead of time and reheat? I think you could, but you'd lose some of the texture that the artichokes get from their saute. If you want to prepare ahead of time, I'd probably keep the artichokes and sauce separate (storing and heating them separately) until you're ready to serve. That said, I've eaten this as leftovers on some occasions, and it's still good - it just loses a little of the crispness that the artichokes get during their saute. Let me know how it turns out!